In these frontierless days, when you hear a beer has taken out a trophy in the Specialty Beer category, you could be forgiven for wondering just what hybrid Frankenstein's monster had charmed the judges. Just what unusual ingredients were in there; what barrels did it spend time ageing in; was it the sort of beer the brewer could ever (or would even want to) make again? 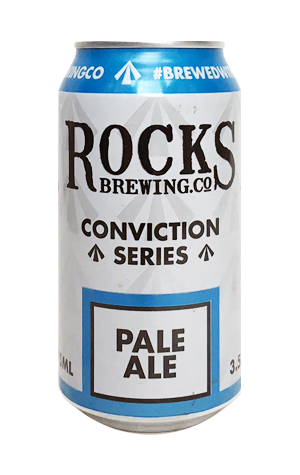 But, at the 2017 Craft Beer Awards (which, from 2018, are to be known as The Indies), that title went to the Conviction Pale Ale from Rocks Brewing. Yes, a pale ale. And a mid-strength at that. The Conviction Pale is doing the rounds again, with Rocks still brewing from its home in Alexandria after flirting with a sale last year. And it's not hard to understand the beer's appeal. We're entering gilded days for mid-strengths in Australia and this is a cracker, firing off aromas of tangerines, pineapple and candied citrus, backed up by lively citrus flavours and a clean finish. It packs pretty decent palate weight for its size too in what's a well balanced and tasty wee drop.